Independence Pro, Virtual Sampler/Sample Player from Yellow Tools. Independence Pro includes Independence 2, Independence Live and Independence FX. Includes a 70GB sound library. The audio engine of Independence 2 was completely redesigned. With the new "multi core support" you can now decide how many cores of your computer you want to reserve for Independence 2. Another change is the possibilty to load 3rd party VST effects and VST instruments directly in Independence 2, so you have access not only to other sample libraries in Independence 2 but also all your other VST effects and/or instruments. The completely new "Browser" page lets you search and import audio and MIDI files.. Beside audio and MIDI files you can also search for any other Independence 2 files such like Projects, Layer Sets, Layer Sets and Sections - with any kind of attributes. The browser contains an attributes batch utility that lets you edit and add attributes for your selected files in one step. The "Quick Edit" edit page was extended with the "remote control" feature: 8 freely assignable knobs and buttons including "learn" option for any Independence 2 parameter and even other applications you are using. This lets you assign your favourite features and functions to these knobs and buttons, so you can customize your Independence 2 workflow. A host application specially designed for Independence 2 performances "live on stage". Beside an unlimited amount of Independence 2 Projects you can also load 3rd party VST effects and VST instruments in Independence Live. The immediate switch between the currently loaded Projects allows you to create your custom setup for any live event, enabled by its flexible audio and MIDI routing. Independence Live supports the use of ANY hardware controller - accesable with the knobs and buttons of the "remote control" area. A virtual effect rack with all the Indepedence 2 insert filters and effects. Now you can use all the Independence 2 insert filters and effects also separately as effect plugin. You have access to over 40 inserts including yellow tools' s realtime impulse response processor "Origami". 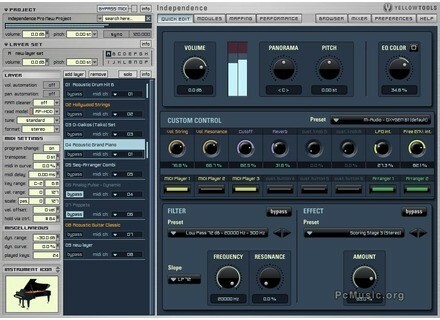 Independence FX comes with hundreds of presets that can be loaded via drag'n'drop using the browser. The virtual rack functionality allows you to add an unlimited number of inserts into Independence FX and also to change their order afterwards. Inspiration Sounds Electro Grime Inspiration Sounds Releases Electro Grime. Big Fish Audio Harley & Muscle Big Fish Audio Releases Harley & Muscle: Deep House Producer. Voxengo Varisaturator Released Voxengo has released VariSaturator, an audio effect plug-in designed to apply saturation effects over audio material.